June 16, 1999: Details seven factors for federal prosecutors to consider in decid- ing whether to pursue criminal charges including whether an environmental compliance program is adequately designed for maximum effectiveness in preventing and detecting wrongdoing and whether management is enforcing the program or tacitly encouraging or pressuring employees to engage in mis- conduct to achieve business objectives. The guidance notes that prosecuting a corporation is no substitute for prosecut- ing individuals. 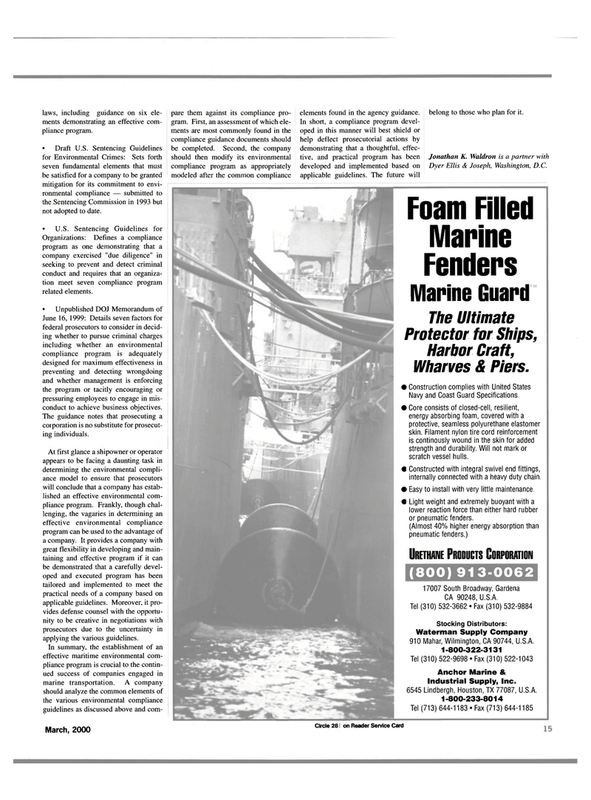 At first glance a shipowner or operator appears to be facing a daunting task in determining the environmental compli- ance model to ensure that prosecutors will conclude that a company has estab- lished an effective environmental com- pliance program. Frankly, though chal- lenging, the vagaries in determining an effective environmental compliance program can be used to the advantage of a company. It provides a company with great flexibility in developing and main- taining and effective program if it can be demonstrated that a carefully devel- oped and executed program has been tailored and implemented to meet the practical needs of a company based on applicable guidelines. Moreover, it pro- vides defense counsel with the opportu- nity to be creative in negotiations with prosecutors due to the uncertainty in applying the various guidelines. March, 2000 17 pare them against its compliance pro- gram. First, an assessment of which ele- ments are most commonly found in the compliance guidance documents should be completed. Second, the company should then modify its environmental compliance program as appropriately modeled after the common compliance elements found in the agency guidance. In short, a compliance program devel- oped in this manner will best shield or help deflect prosecutorial actions by demonstrating that a thoughtful, effec- tive, and practical program has been developed and implemented based on applicable guidelines. The future will belong to those who plan for it.